Also available: External Mini SAS to SAS, and Internal Mini SAS to SAS. 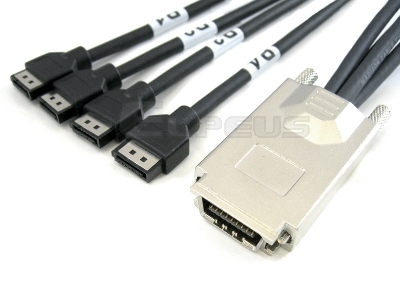 External SAS 4x SFF-8470 to SFF-8470 cables feature a 4x SAS External SFF-8470 connector on both ends. 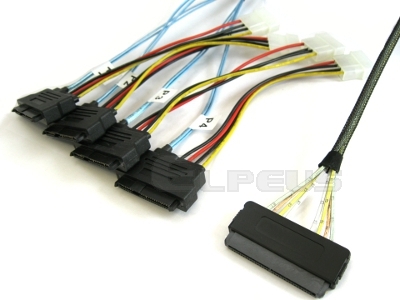 This cable is built using high speed 28 AWG and 24 AWG wire. Applications include InfiniBand, Serial Attached SCSI, and SATA. We offer standard lengths of 1 to 10 meters. Custom lengths are available upon request. External SAS 4x SFF-8470 to 4 x eSATA SAS cables feature a 4x SAS External SFF-8470 connector on one end, and 4 x eSATA connectors on the other end. 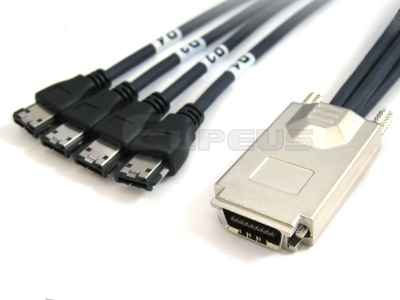 This cable is built using high speed 28 AWG wire. Applications include InfiniBand, Serial Attached SCSI, and eSATA. We offer standard lengths of 1 to 3 meters. Custom lengths are available upon request. 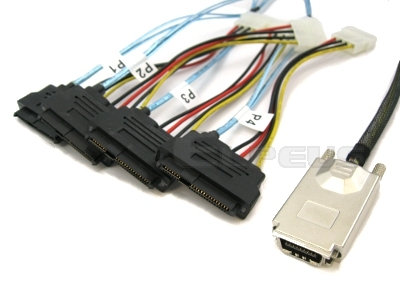 External SAS 4x SFF-8470 to 4 x SATA cables feature a 4x SAS External SFF-8470 connector on one end, and 4 x 7pin SATA connectors on the other end. This cable is built using high speed 28 AWG wire. Applications include InfiniBand, Serial Attached SCSI, and SATA. We offer standard lengths of 1 to 3 meters. Custom lengths are available upon request. External SAS 4x SFF-8470 to 4 x 29pin SAS SFF-8482 cables feature a 4x SAS External SFF-8470 connector on one end, and 4 x 29pin SAS SFF-8482 connectors on the other end. This cable is built using high speed 30 AWG and 28 AWG wire. Applications include InfiniBand, Serial Attached SCSI, and SATA. We offer standard lengths of 1 to 3 meters. Custom lengths are available upon request. Internal SAS 4x SFF-8484 to 4 x 29pin SAS SFF-8482 cables feature a 4x SAS Internal SFF-8484 connector on one end, and 4 x 29pin SAS SFF-8482 connectors on the other end. This cable is built using high speed 30 AWG and 28 AWG wire. Applications include InfiniBand, Serial Attached SCSI, and SATA. We offer standard lengths of 0.5 to 1 meter. Custom lengths are available upon request. 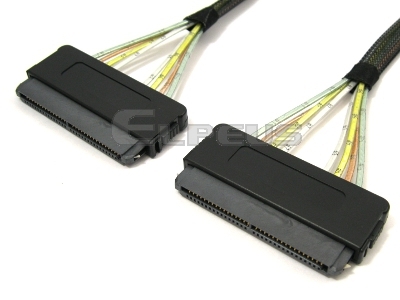 Internal SAS 4x SFF-8484 to 4 SATA cables feature a 4x SAS internal SFF-8484 connector on one end, and an Internal 4 x SATA on the other end. This cable is built using high speed 30 AWG and 28 AWG wire. Applications include InfiniBand, Serial Attached SCSI, and SATA. We offer standard lengths of 0.5 to 1 meters. Custom lengths are available upon request. 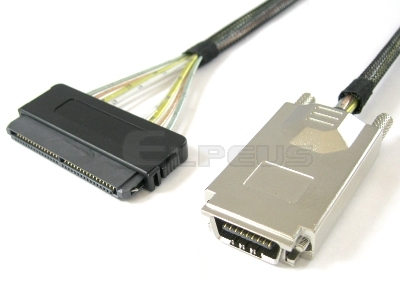 External SAS 4x SFF-8470 to Internal SAS 4x SFF-8484 cables feature a 4x SAS Zinc Die Cast SFF-8470 connector on one end, and an Internal 4x SAS SFF-8484 on the other end. This cable is built using high speed 28 AWG wire. Applications include InfiniBand, Serial Attached SCSI, and SATA. We offer standard lengths of 0.5 to 1 meters. Custom lengths are available upon request. 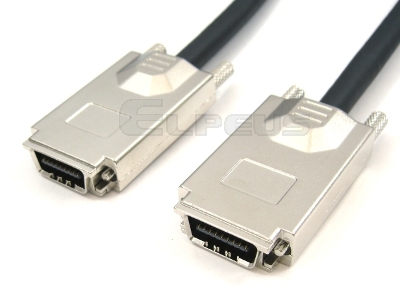 Elpeus internal 4x SFF-8484 to 4x SFF-8484 cables feature a internal 4x SAS SFF-8484 connector on both ends. This cable is built using high speed 30 AWG wire. 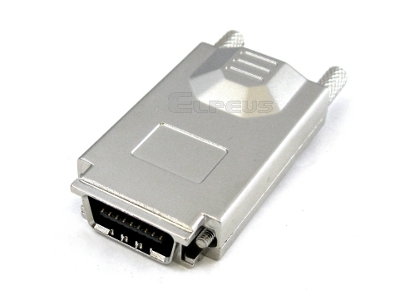 Applications include Serial Attached SCSI, InfiniBand and SATA. We offer standard lengths of 0.5 to 2 meters. Custom lengths are available upon request. 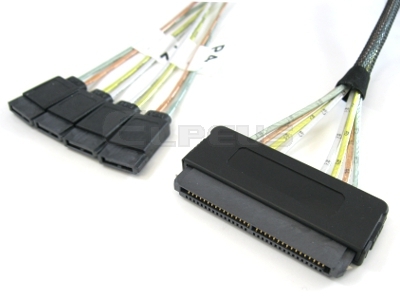 SAS SFF-8470 loopback modules with jackscrew connectors are used for testing ports in SAS HBAs and switches. The loopback provides a cost effective method for SAS port testing. It transmits data from the host electrically, to the receive data outputs and back to the host.